We all have heard the saying/expression "Moms know best!". I've heard my mom said it over and over again during my teenage years. I didn't believe it until I became a mom! And once we become moms, we gain a superpower! I'm sure it's not only me who get that indescribable feeling when there's something wrong with our kids. We don't know what exactly it is but often than not, we moms are correct. This year, Expo Mom is celebrating #Momtuition! “Today’s moms have access to so many sources of information that we sometimes forget that we are gifted with a very powerful sens —our instinct. They say all women are born with such an instinct, but I believe that moms have a heightened sense since we give so much care and nurturing love to our family and children and are so connected to them. We want to remind moms about this “superpower” and this is why we chose ‘mothers’ instinct’ or we call it MOMTUITION as our theme for this year’s EXPO MOM,” says Janice Villanueva, founder of Mommy Mundo, organizers of Expo Mom, the definitive source of parenting-oriented trends, products, and information. Sharing with you is this video of Kris and Jenny of SoMoms talking about #Momtuition! At Expo Mom’s trademark mompreneur market, a wide range of products and services, including the latest from fave mom and baby brands, will bring out the best in mommies. 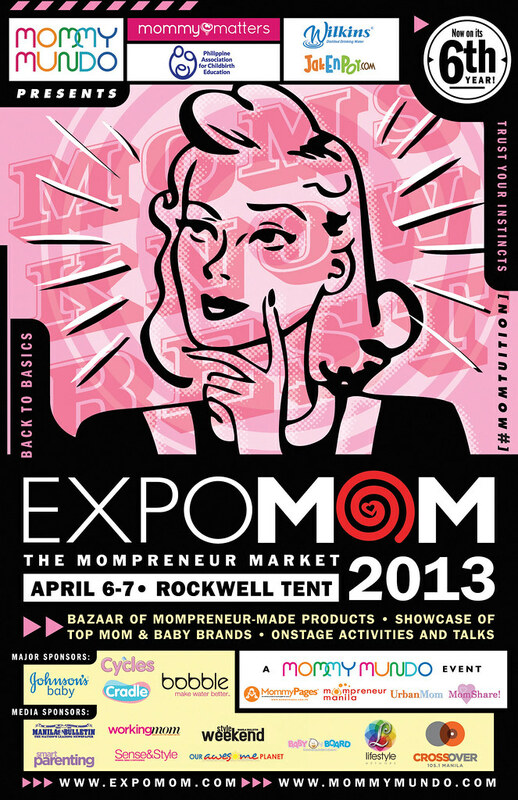 Mompreneur booths such as Nursing Mom, Mama Baby Love, Momtrepreneur Shop, Tot Couture, Indigo Baby and Nurture Nook. Expo Mom 2013 will also showcase of host of informative and entertaining workshops and activities. Created for moms and moms-to-be, Expo Mom also provides the necessary mom amenities such as a breastfeeding lounge, a diaper changing area, and a play area for young kids. Paper Chic Studio will also be a part of the Expo Mom. Hope you'll visit my booth as well as the SoMoms booth! I would love to meet all of you! And now on to the giveaway! I'll be giving away 5 Expo Mom Swag Bags to 5 lucky readers! Yay! Mechanics are very very easy! Working Mom Magazine, Lifestyle Network, Smart Parenting, Baby on Board, Crossover 105.1 FM, Ourawesomeplanet.com, Urban Mom Magazine and www.MommyPages.com.ph. Last weekend, I knew it wasn't a good idea to go out of town coz my son was not his usual active self the night before so I thought he was coming down with something. The next day he had fever and a cold. in a regular day at the office, i suddenly thought of my son so i passed by his fave fastfood and grabbed a spag and ice cream. when i arrived home, he was asking his titas to ask me to buy spag and ice cream for him. in the office, i have set a regular time to call home so that I can check on my baby. This is usually at around 6 or 7 pm before bedtime. I no longer call beyond or before. There was this one time that I had the urge to call right after i got to the office (3pm) just because. True enough, the yaya said baby geoff kept on vomitting, thus I had to go back home and bring him to the doctor. My MIL and son was watching tv, while i was tidying up the room. Out of nowhere, i had this urge to check on them. Good thing i did, because my son had reach out and got the nail clipper on the table and was about to eat it! Just the other day, when I felt like my younger son was coming down with a cold. just last night.my 7 months old baby keep on crying.mainit ang ulo til midnight.i cradled him and breastfeed.1am na kami nakatulog. I use my "superpower" #momtuition everyday! Juggling, a full-time job, house chores and 2 little kids, keep me on top on my "supermom powers". I am still currently using my superpower! Working from home while cooking dinner for my kids! #momtuition? Being a supermom is like an everyday job! I'm a working mom that's why I have to use my superpower everyday. Being a call centre agent is very draining but then I still have to breastfeed my cutie 8 month old Yza. Hmm.. Mine is a 9 month old so it's really difficult to tell when did I last used it. PErhaps I use it to know if he's sleepy, hungry in pain or what so I'd say it was ljust a couple of hours ago. I use my momtuition everyday. I know when my son is hungry even before he tells me or what he wants to do like go to the park, use the iPad, etc. Everyday! Being a young mom, and a breastfeeding mom too, can take so much energy and commitment and also, I have to learn everything from scratch! Just now, baby wants to watch Barney with me and she doesn't even want me to hold my phone while watching! I have to sneak once in awhile! Im a first time mom to a 6week old baby girl and I use and rely to my momtuition everytime! Thank you moms for joining! :) See you at the Expo Mom! I used my momtuition this morning, when me and my kids are in bed, I have the feeling that my baby girl needs to go peepee or something. She is still on potty training. I wake her up and bring her to the bathroom. Wola! she pee alot and poop. While she sits on the potty she baby sign to me that her tummy hurts while sleeping. Well, almost everyday I use my mompower. This is natural to all mommies, they just have to believe it and use it wisely.